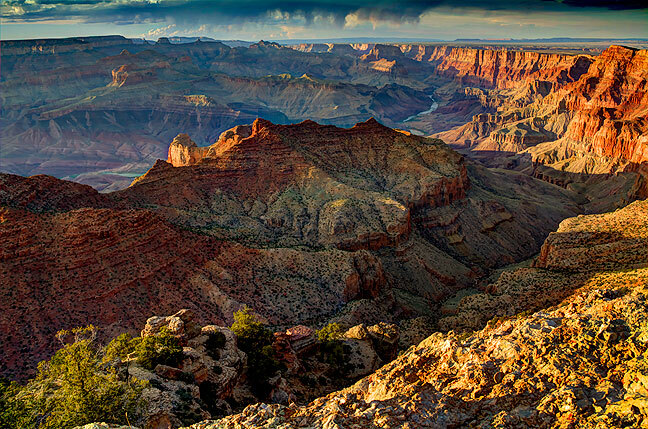 The golden moment blends with the blue hour at Grand Canyon National Park’s Navajo Overlook. In the far upper right corner of this image you can see the watchtower at the Desert View Overlook. 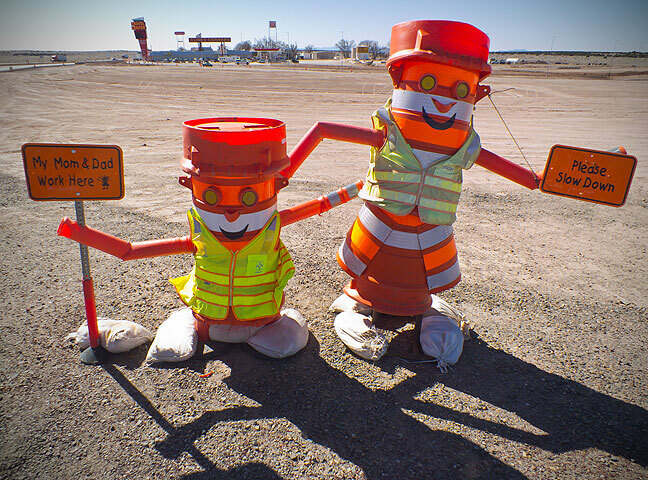 I spotted this fun construction sign at Clines Corners, New Mexico, early in my trip. 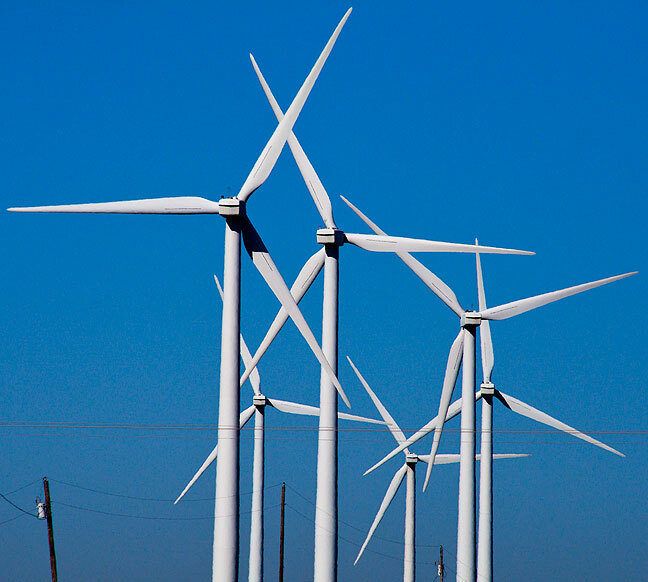 My route through the western Texas panhandle and eastern New Mexico is a particularly windy section of highway, and wind farms like this one are becoming very common there. My drive from Oklahoma included a planned stop for dinner in Albuquerque with Greg Smith and his wife Terry. 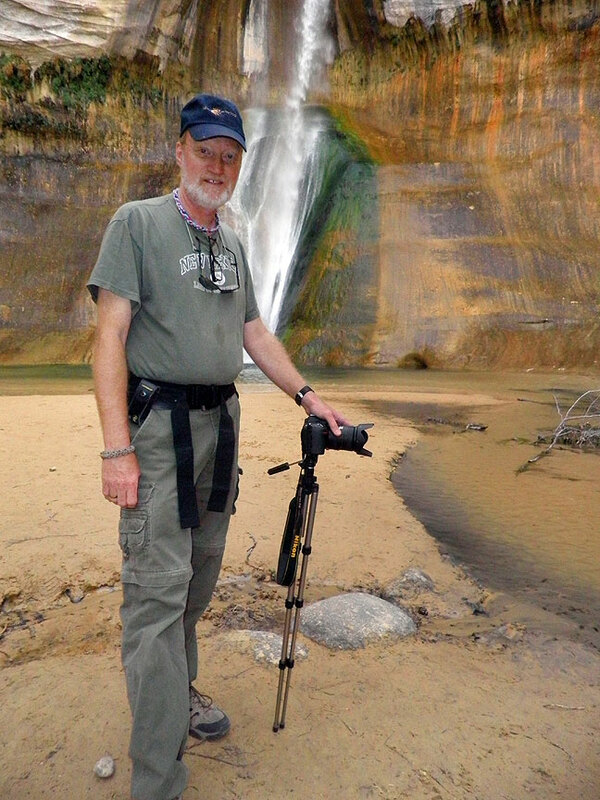 Readers might recall that I hiked and photographed the Penistaja Wilderness last year with Greg. I was only passing through this time, but it was good to see them both. Greg recently bought a large format film camera and several lenses, and is excited to be experimenting in the darkroom. 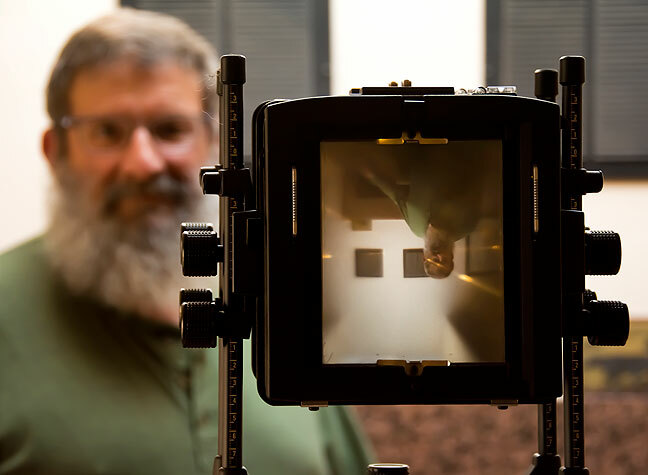 Greg Smith poses with his large format camera; the inverted image on the ground glass is one of the “old school” joys of the view camera. The three of us shared a very spicy dinner at a Thai restaurant near their home. 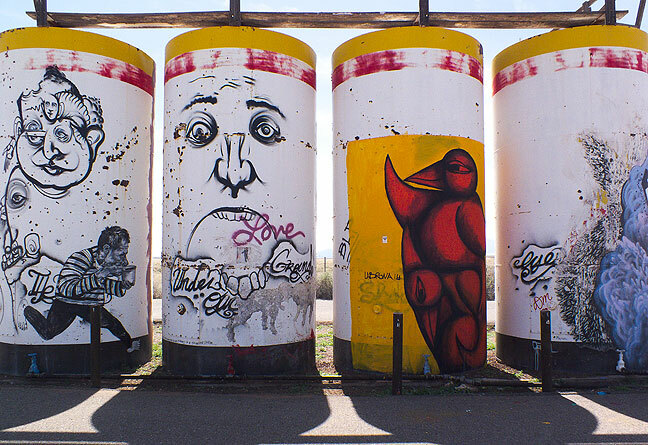 Here is another view of the graffiti-tagged tanks at Gray Mountain, Arizona. Without a concrete itinerary, I kept my eyes and mind open to possible hiking and photography opportunities. When I saw signs for Walnut Canyon National Monument near Flagstaff, I recalled all the times I told myself I would visit it the next time I was in the area, and this was that time. The canyon itself isn’t particularly photogenic, nor were the ruins protected there, but it was nice to be out of the car and on a trail. 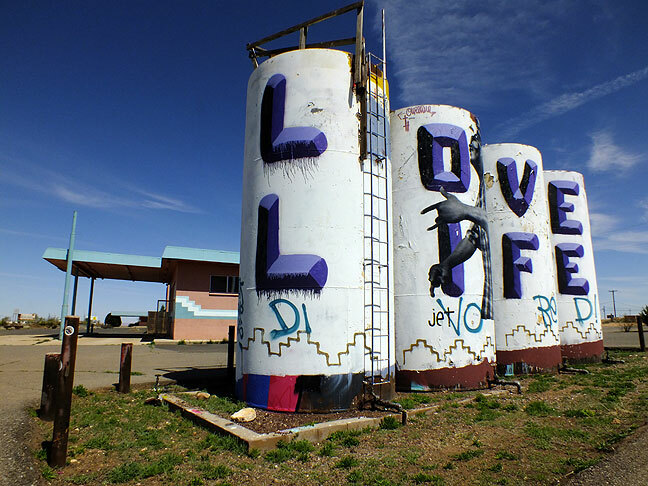 Heading north from Flagstaff, I stopped to photograph four white water towers tagged with “Love Life” grafitti in Gray Mountain, Arizona. These tanks in Gray Mountain, Arizona had been heavily, and interestingly, tagged with graffiti, such that I was not the only one who stopped to photograph them as I passed through. Your host poses for a photo at the Little Colorado overlook. 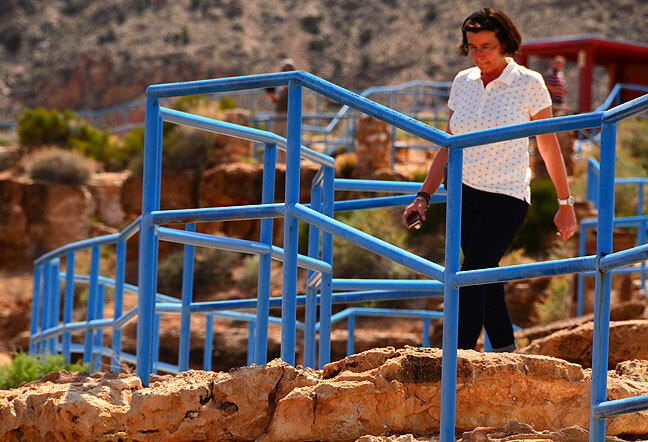 A woman makes her way down a maze of stairs at the Little Colorado Overlook. I didn’t even notice the stairs until I was walking back to my car. The Desert View at the Grand Canyon was less crowded and more interesting than when Abby and I saw it in 2003. The watchtower is restored and looks great. I took advantage of my fisheye and made several images with it. 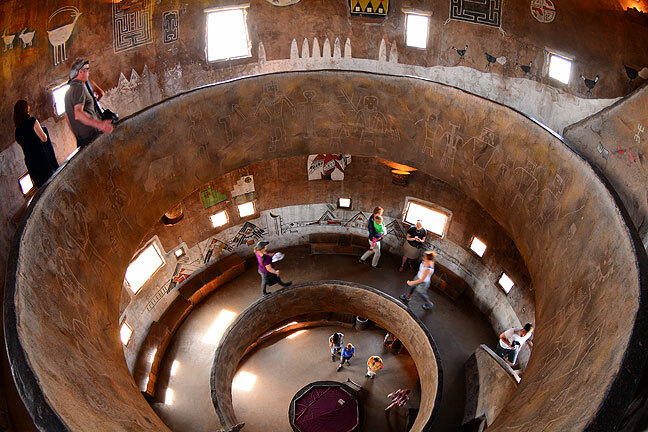 This fisheye image shows the inside of the watchtower at the Grand Canyon’s Desert View. 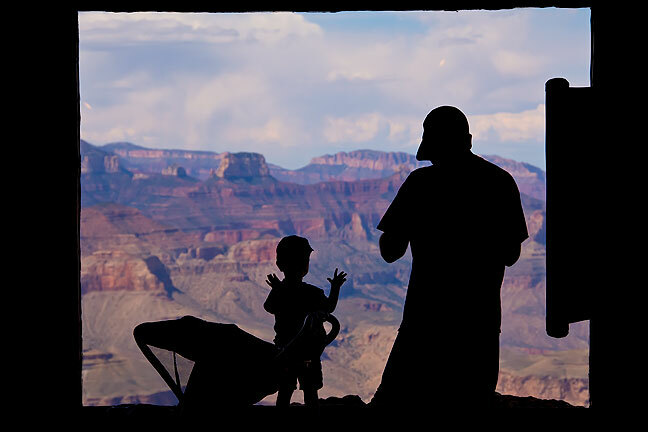 A small boy and his father look at the Grand Canyon from inside the watchtower at Desert View. As I drove west along the rim, I heard an amateur radio operator in a glider over Prescott, Arizona, on the calling frequency, and gave him a signal report. 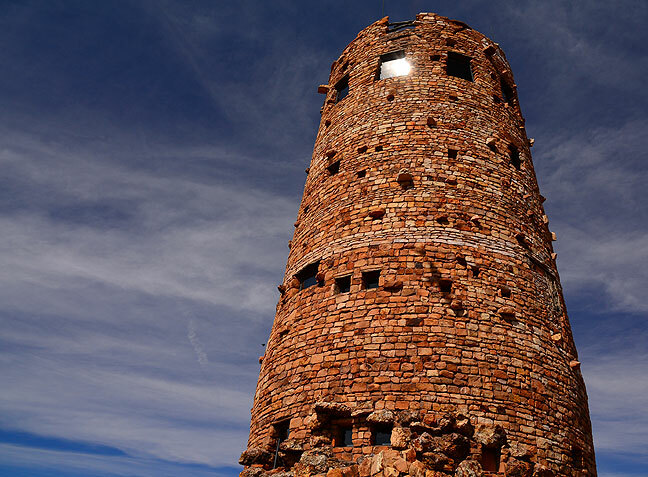 Afternoon sun catches a window in the watchtower at Desert View in Grand Canyon National Park. Not all that glitters is gold, nor is everything beautiful in the desert. 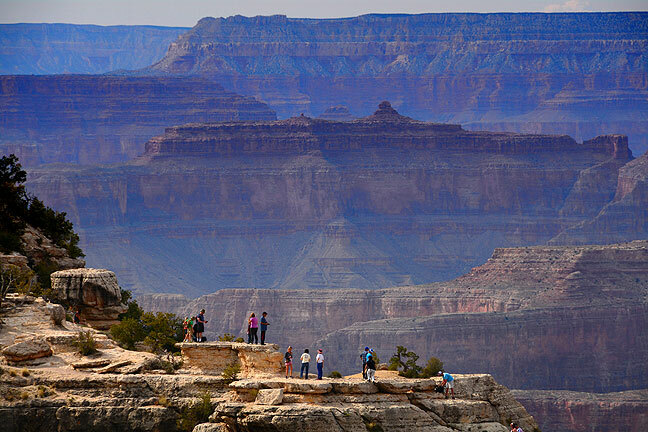 The main visitor center at Grand Canyon National Park was bustling with noisy tourists. 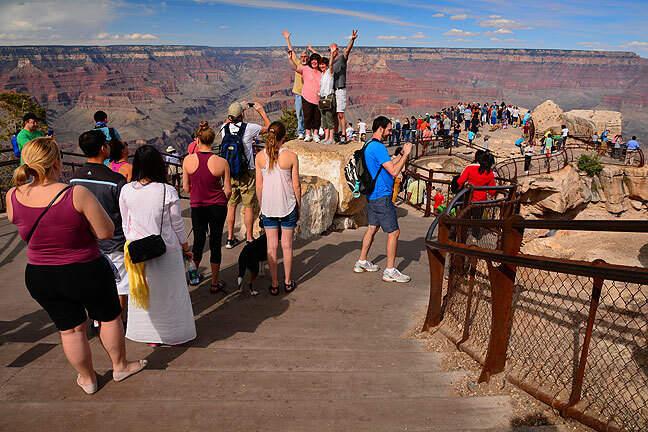 At the palatial new Grand Canyon South Rim Visitor Center, crowds were in the thousands. I thought to myself that people have no idea the kind of hell they create with tour busses. This slightly more serene view near the Grand Canyon visitor center was made from Mather Point looking west. 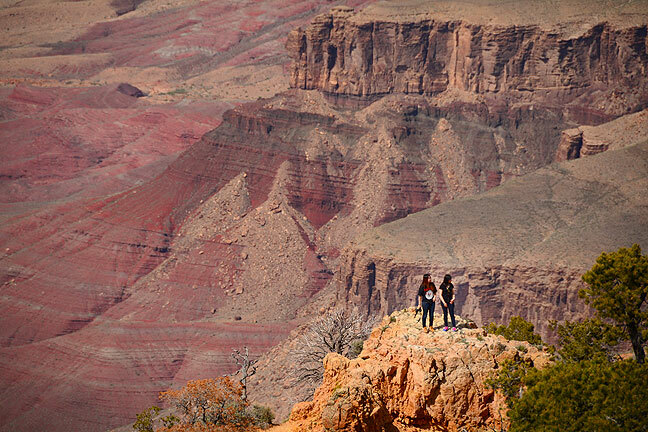 Visitors climb on a precipice at Grand Canyon’s Desert View. 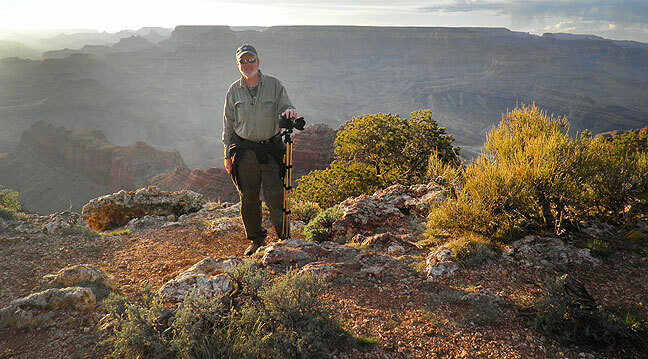 Happy to be making pictures, your host poses for one at the Grand Canyon. I ended up at the Navajo Overlook for sunset which was not at all crowded. The light was stubborn until the moment of truth, sunset, when I got some very decent light. 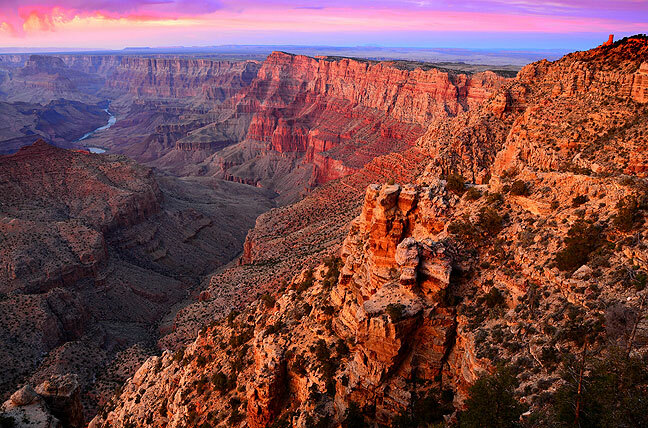 Sunset light matures at the Grand Canyon’s Navajo Overlook. 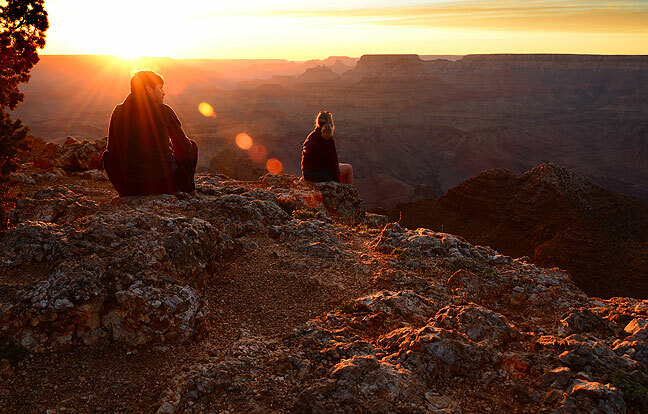 Fellow visitors take in the majesty of the Grand Canyon’s Navajo Overlook at sunset. 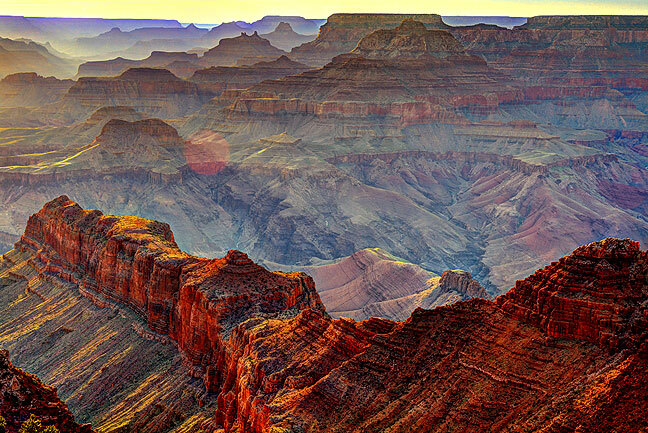 Many layers of erosion, both vertical and horizontal, create depth in this image at the Grand Canyon. 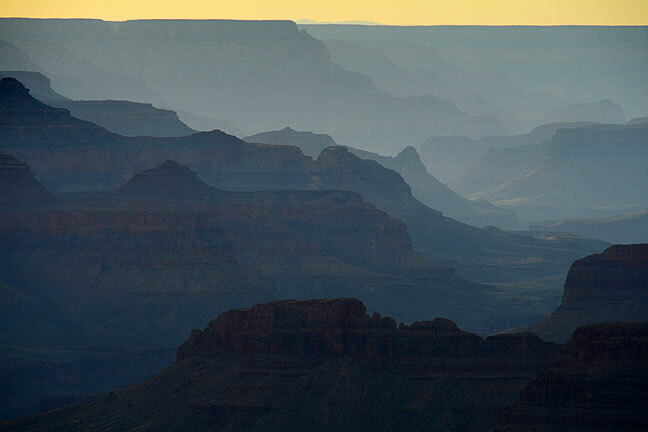 This was my first experience photographing the Grand Canyon at sunset. As you can see, the light did not disappoint me. 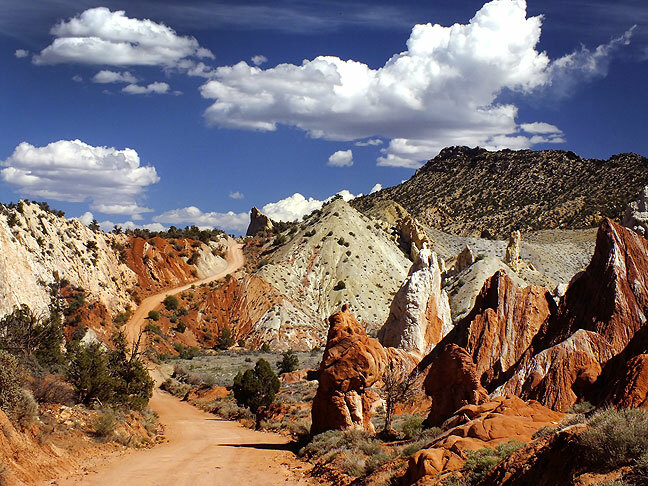 The Cottonwood Canyon Road from U. S. 89 in Arizona to State Highway 12 in Utah was rough and rutted from the wet winter, and took longer than I expected, though there were no technical or 4WD sections. This is the garden spot of the Cottonwood Canyon Road. I made a similar image in 2008, the last time I drove it. My first image along the Hole-in-the-Rock Road was this abandoned, collapsed steel tank. In Escalante, at the Bureau of Land Management’s expensive newish Grand Staircase/Escalante National Monument Visitor Center, I picked up a free permit to camp two nights in the Monument. Since there are no campgrounds (other than the always-full Lower Calf Creek Campground), car camping and backpacking is at-large. They tell you not to camp within 200 feet of water or a trail head, and don’t block the road, but otherwise camp wherever you want. They encourage you to stay where there are signs of previous camping. Fellow hikers descend Zebra Slot as I ascend. 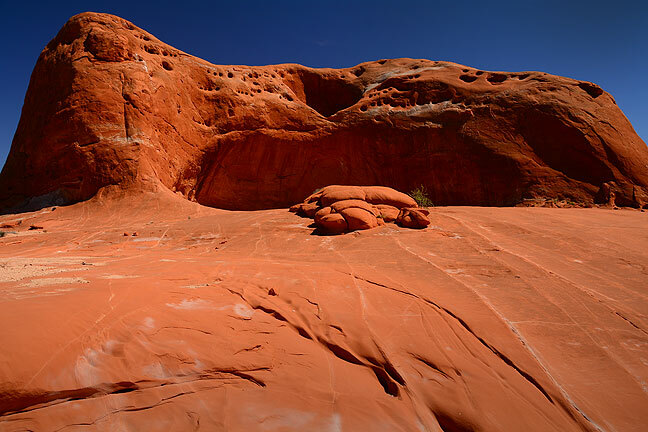 Experience from photographing slot canyons over the years has led me to bring and use my 10-17mm Tokina fisheye, and as you can see in this image, that was a good call. 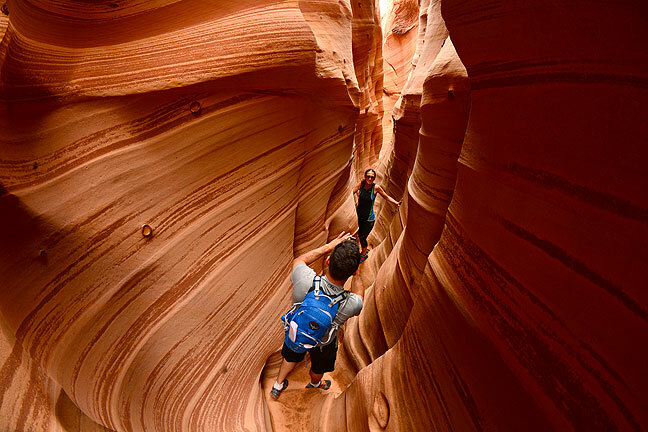 A young couple makes images in Zebra Slot Canyon. The Hole-in-the-Rock Road, unlike Cottonwood Canyon, had been recently bladed, but had already begun to show moderate washboarding. I found that where possible, driving above 40MPH smoothed things out, a trick I’ve been using since dealing with the road to Chaco Canyon starting in 2000. I was at the Zebra Slot Canyon trail head before midday. The trail is unmarked, but easy to follow. Rangers and the internet caution that it’s easy to get lost by accidentally following Harris Wash, but I found that part of the route obvious. The Zebra Slot itself was one of my top tier items to see, and was everything I hoped and expected. from the mouth to the end is less than 200 yards, with just a couple of squeeze-through spots and no climbing. A couple of hikers had dropped their gear at the start of the narrowest part, but I needed what was in my pack, so I kept it with me, and it wasn’t much of a problem. The “Zebra” part at the very end is just 15 or 20 yards long. 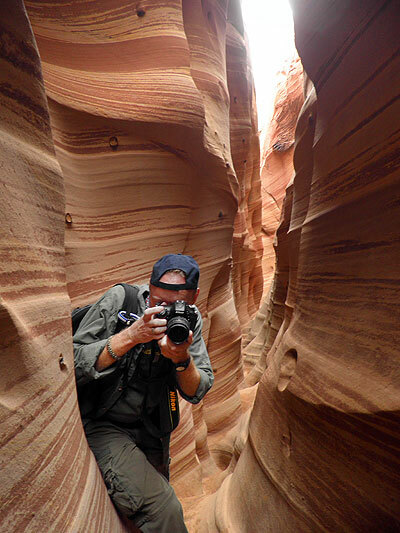 The author makes pictures in Zebra Slot Canyon. While I was there I heard a voice say, “Come on. There’s a guy up ahead with a camera,” like he couldn’t believe I got my gear in there. I encouraged them to come the rest of the way, and they did. It was a friendly couple from San Francisco named Gray and Martha. I ran into them several more times during the afternoon and evening. Back at the trail head I decided I had about enough time to hike around Devil’s Garden and photograph the beautiful Metate Arch as the sun went down. The sky remained hazy, but I feel like I made some decent images. I set up my camp at a wide spot on the Harris Wash Road. I made Mountain Home brand rice pilaf, which was pretty good. I heated the water for it with my JetBoil stove. I nodded off several times in my camp chair, which was a great feeling. During my stay, no cars passed my location. 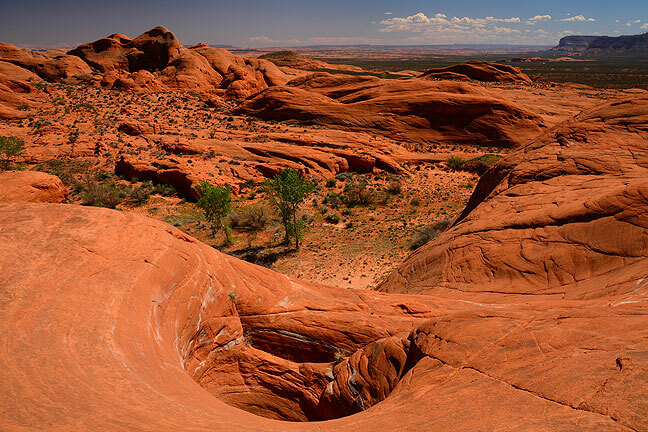 Though a small area, Devil’s Garden is worth the visit, particularly if you like to explore without following trails. 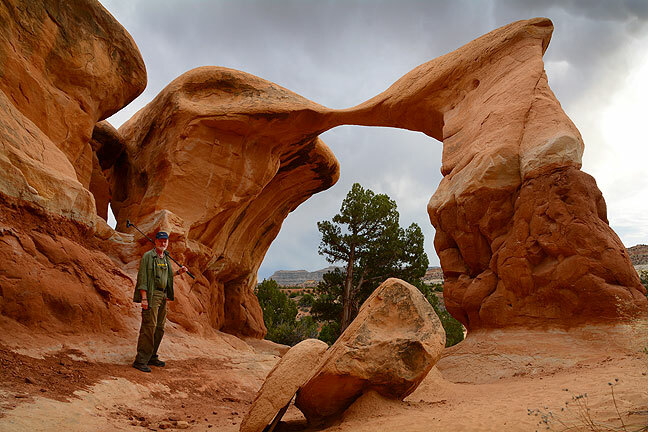 Later in the afternoon, I blundered around Devil’s Garden, a small but interesting area with several natural arches, including this one, Metate Arch, under which I posed for scale. 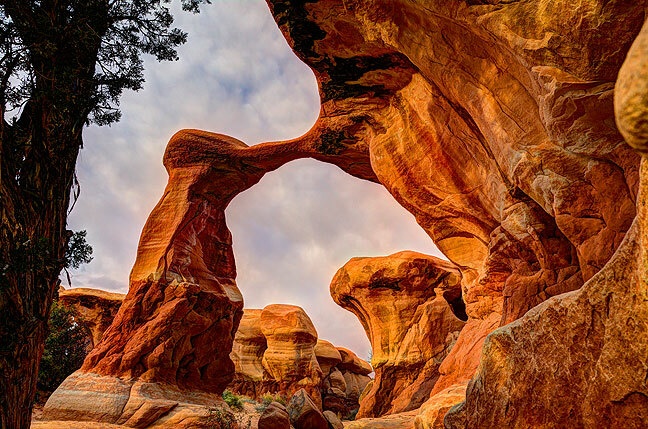 Metate Arch in the Devil’s Garden section of Grand Staircase/Escalante takes on a deep, complex pallet in this five panel high dynamic range image made as sunset approached. 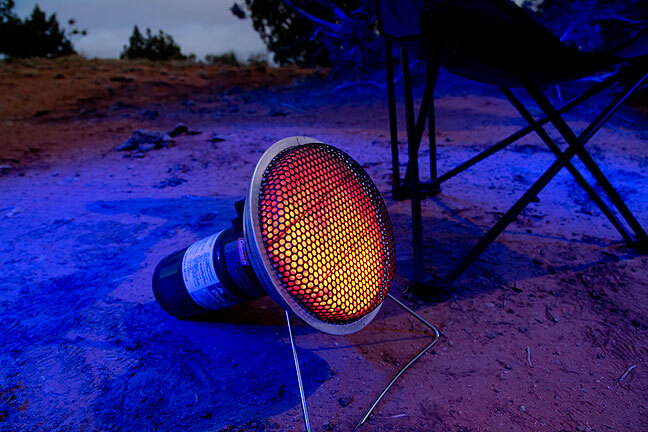 Grand Staircase/Escalante National Monument’s policy encourages using fir pans and packing out ashes, so it was easier for me to forego a wood fire and instead us my propane heater for warmth, which worked great. This image was made about 30 minutes after sunset with the aid of my blue flashlight. 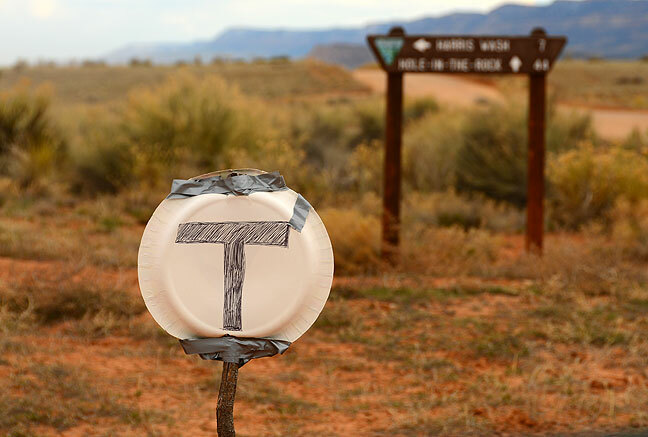 A handwritten “T” on a paper plate at the Harris Wash turnoff; I have no idea what it meant. 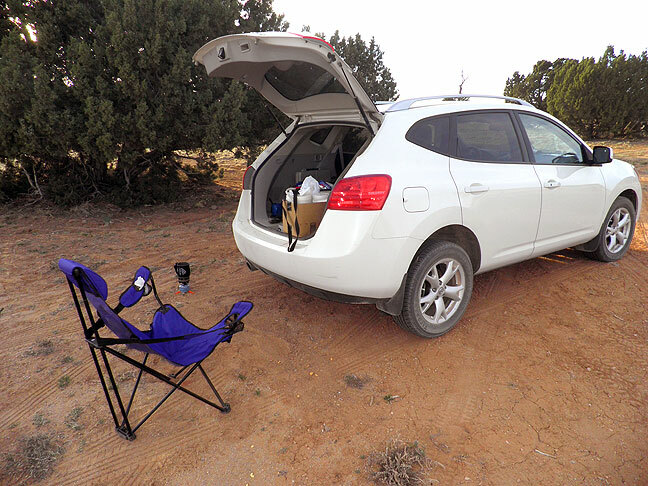 I slept in my car, which simplified camping considerably, since breaking camp consisted of folding up my camp chair. My sleeping bag, a mummy-style, made Saint Elmo’s Fire when I pushed it around or zipped it in the dark. The only problem with the sleeping arrangement was that my mummy bag is made of a very slick Nylon material, and tended to slide down toward the back of the car as I slept. 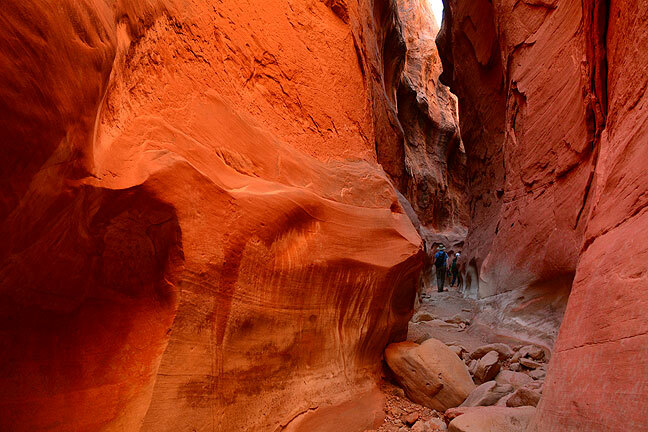 The mouth of Peek-a-Boo Slot Canyon features with 12-foot-tall wall. Despite its imposing look, it is easy to scale, thanks to Moki steps and decent hand holds. 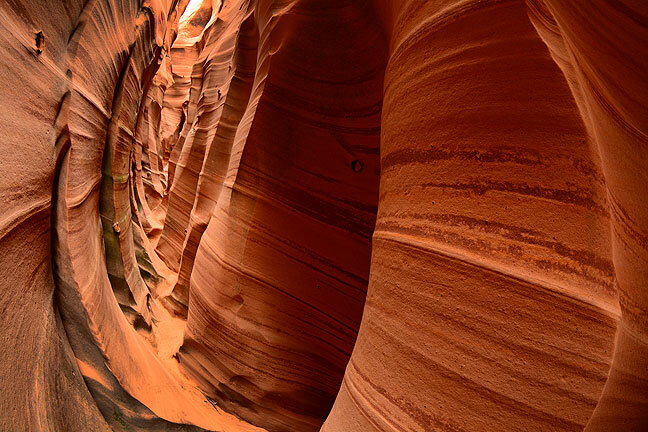 The road to the Peek-a-Boo and Spooky slot canyons was the only questionable affair of the whole trip. A single-track road with a large gully on the left side (when driving in), it was marked with a “Four Wheel Drive Only” sign. The Rogue shook it off with no difficulty. At the trail head I met a man named Chris who was hiking with his daughters Heather and Reagan, with whom I hiked for some of the morning. The trail led down a fairly steep canyon to a wash where we joined a wide-ish slot that took us west. 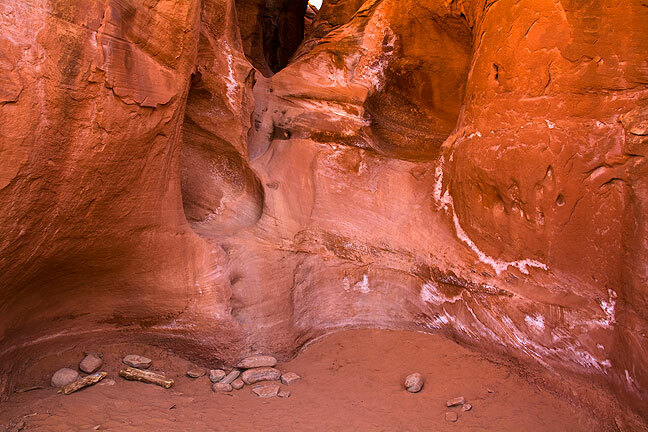 GPS identified it as Dry Fork of Coyote Gulch. We hiked to a point where we ascended into the open desert, then back down. 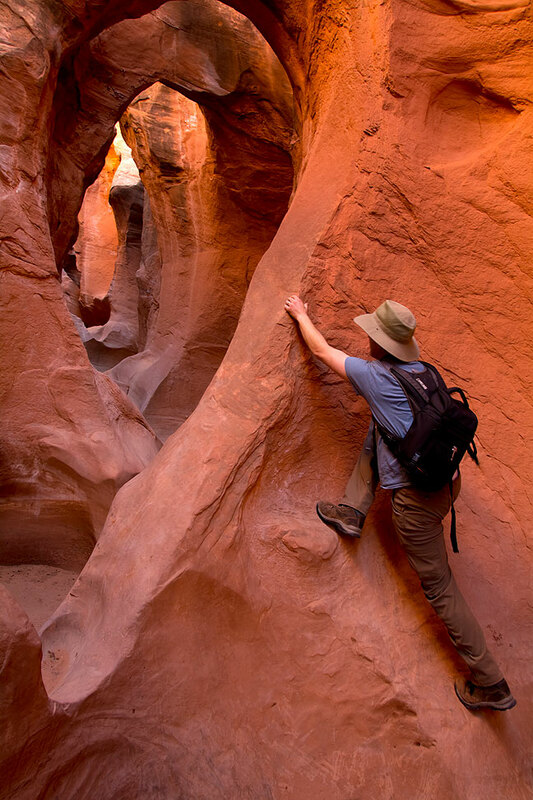 Though not as popular as Peek-a-Boo or Spooky, nearby Dry Fork of Coyote Gulch was visually interesting and easy to hike. You can see Chris and his girls, who I met at the trail head, up canyon some distance. 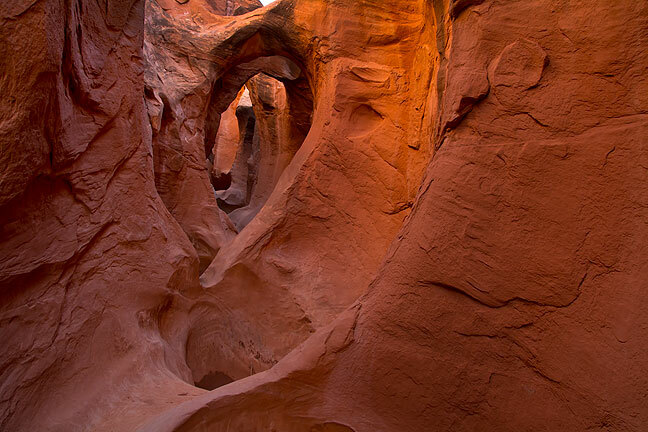 The arches of Peek-a-Boo Slot Canyon are visible in this image. Although I didn’t do it, Peek-a-Boo and Spooky can be done as a loop. 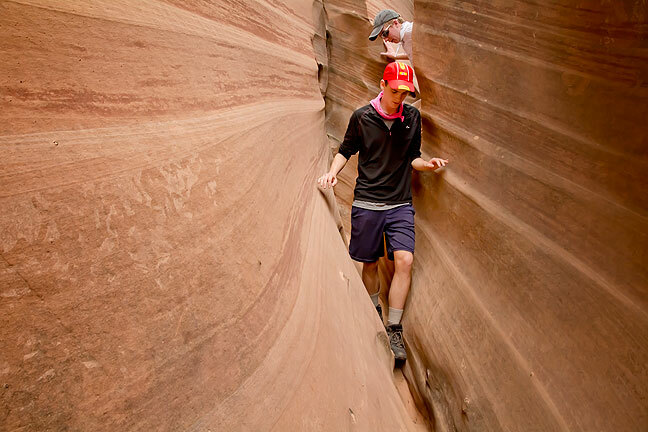 Chris from Logan, Utah, climbs a ledge in Peek-a-Boo Slot Canyon. Not far to the east was Peek-a-Boo. Web searches said there was a 12-foot wall to climb at the mouth of the canyon, which was correct, but which was cut with Moki steps, and was not difficult. By the time I reached the natural arches for which the canyon was named, we came across some shelves and overhangs that I was uncomfortable climbing because I was wearing my Keens (since I had been cautioned that some canyons might involve wet crossings), which have fairly poor tread on them, so I turned back. Moving on to Spooky, I found the mouth of the canyon easily and entered to discover almost immediately why it is called Spooky: as you proceed, the canyon gets almost impassably narrow, and even though I don’t generally feel claustrophobic, I felt a very strong sensation of being trapped. I made my way some distance up the canyon until I felt I had experienced and photographed its character. 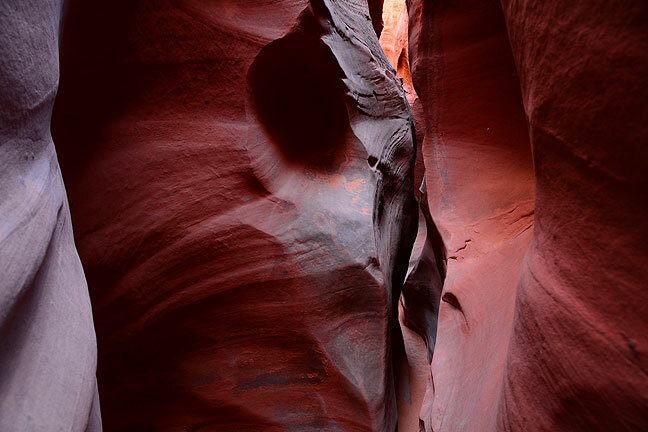 This view looks into the dark depths of Spooky Slot Canyon, so named because, as you can see, hikers must squeeze through some very narrow, deep passages, which can get pretty spooky. 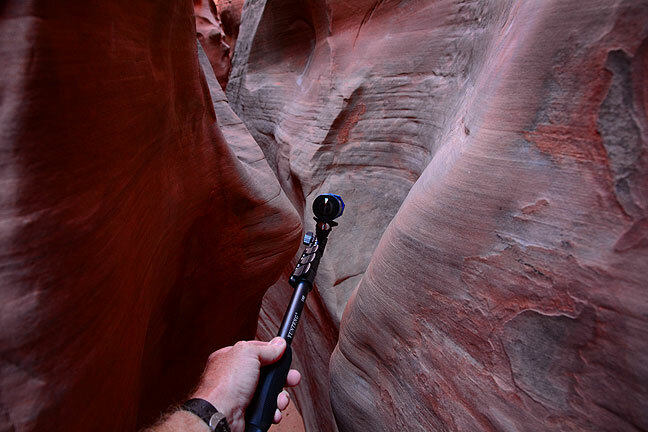 This image shows my action cam as I make video of my trek deep into Spooky Slot Canyon. 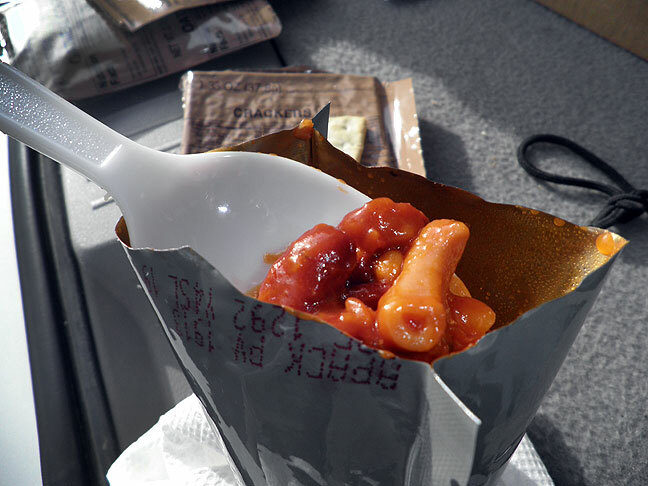 This is “Meal Ready to Eat,” or MRE, which my sister sent to me after FEMA gave her some during their last hurricane. It was tasty and easy to prepare. By the time I made it back to the trail head, it was lunch time, so I drove to Dance Hall Rock. 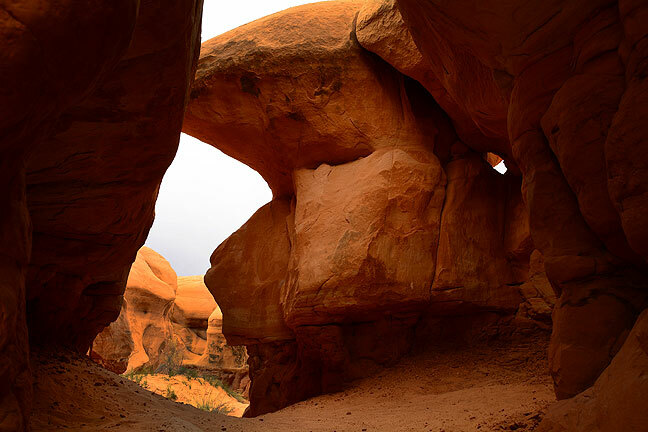 After eating, I explored the area behind the signature piece to discover an enormous slab of sandstone slick rock, interrupted only by deep house-sized potholes. I climbed until I felt I was at the high point of the formation. The wind was furious, but it was well worth the effort. Deep afternoon light and deep blue skies mark Dance Hall Rock, which I explored for some time, and which I had entirely to myself. The area behind Dance Hall Rock is a slick rock wonderland, and features a number of deep, house-sized potholes with no outlets. 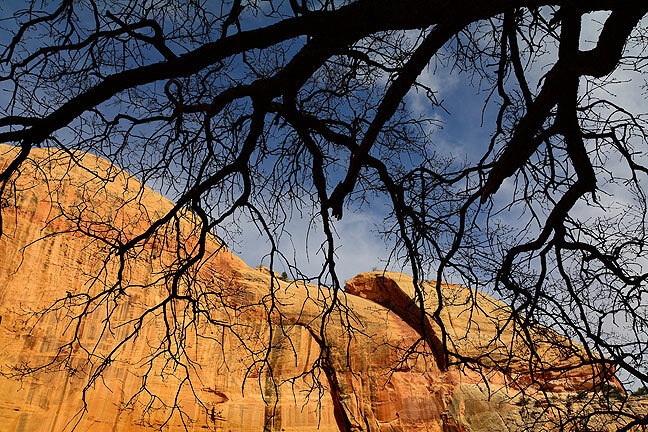 This was one of the few images that came out of the long hike to Calf Creek Falls. I asked a fellow photographer (the one in the next image) to shoot this for me. My last hike for the day was Lower Calf Creek Falls. I’d seen many nice images of it on the web, and Gray and Martha touted it, so I felt I shouldn’t miss it. The trail head is at the parking area of one of only two campgrounds in the Monument, which was quite crowded. The trail itself, three miles to the falls, is very easy (somewhat explaining its popularity), and not very interesting until you get to the actual waterfall. At 126 feet high, it’s quite impressive, but its stature is difficult to express visually unless you get a human figure in the frame, which I tried to do using another photographer who was working close to the water. The water from the falls was pushed around by the wind, and frequently sprayed us. 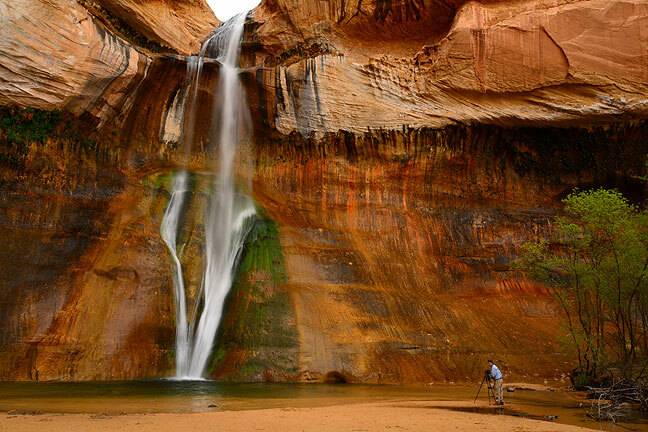 Using a fellow photographer for scale helps illustrate the size and beauty of Lower Calf Creek Falls. 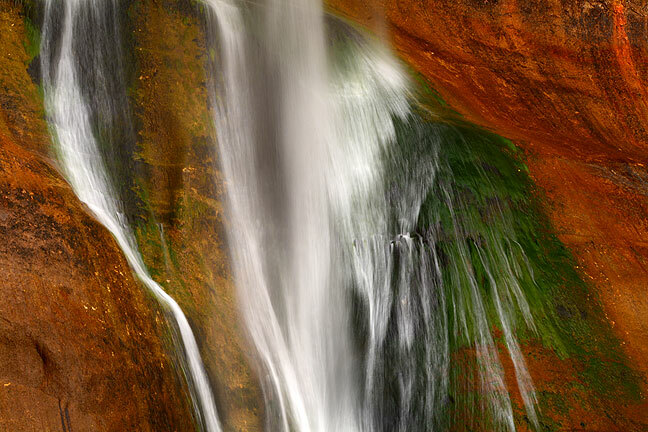 Water streaks down the cliff face at Lower Calf Creek Falls. This is my camp site on my second night in Grand Staircase/Escalante, though it differed little from the first night’s. 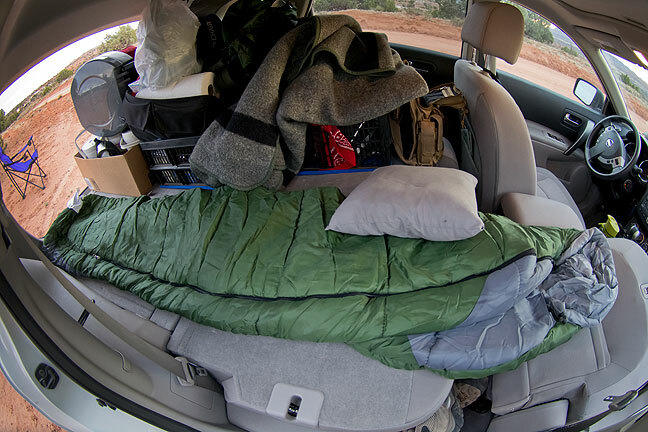 This fisheye view shows my sleeping bag stretched out on the fold-down seats of my Nissan Rogue as I prepare to sleep. It was evening by the time I was off the trail, so I drove back down to the Hole-in-the-Rock Road. I thought I might get the same spot I had the night before, but just a few hundred yards from the intersection with the highway I saw some campers in a pasture that had clearly been adopted as a de facto campground, so I pulled in there and found a nice spot near a big juniper. A funny aside: my reading glasses hung from the collar of my t-shirt, and both nights camping in my car I forgot to remove them, so I slept with them there all night. 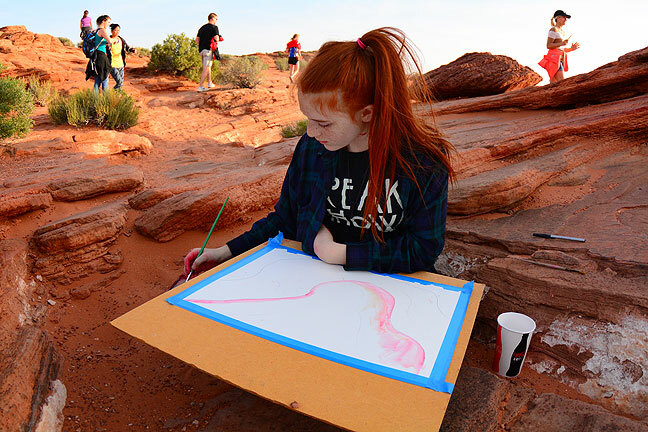 I ran into a high school art class at Horseshoe Bend. They were drawing and painting the scene. 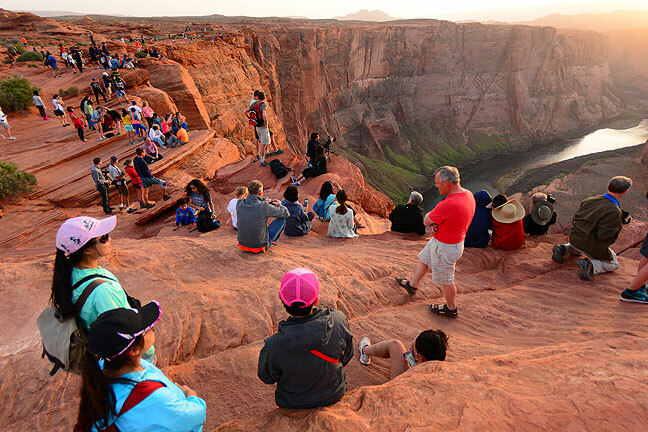 The crowds were thick at Horseshoe Bend, but everyone was cordial. 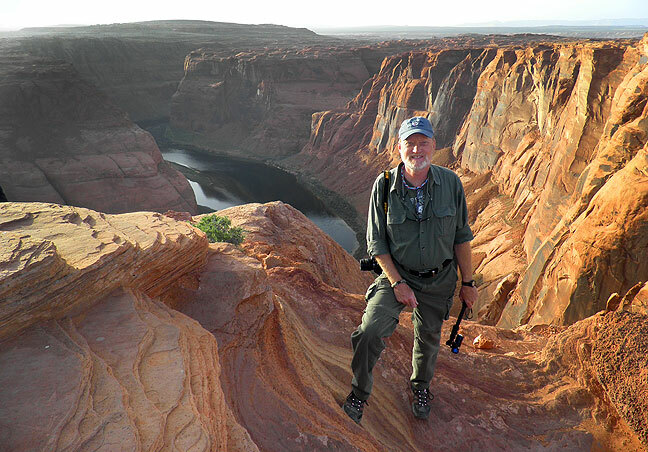 Your host smiles for a photo at Horseshoe Bend of the Colorado. There was no shortage of people who were happy to take my picture with my camera if I asked. I owe some of the credit for this image to improvements in software in the three years since I last photographed it. I was able to easily blend five exposures into this high dynamic range image, and I was able to shoot it with my fisheye and “uncurve” the frame for this rendition, which I think is spectacular. 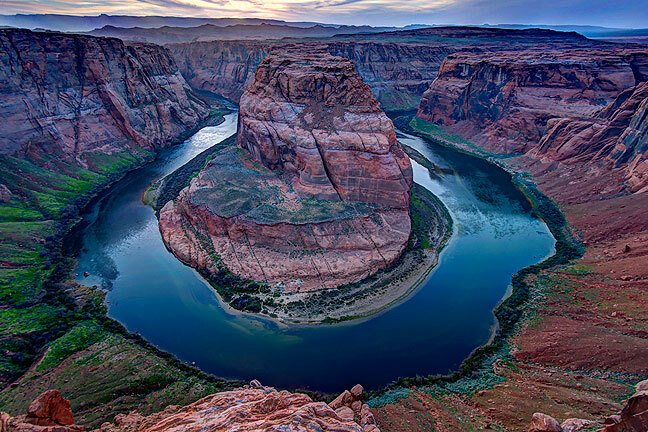 This view of Horseshoe Bend of the Colorado was made about 20 minutes after sunset, thus the blue hues. I shot up Utah 12 to Boulder to see what caught my eye. 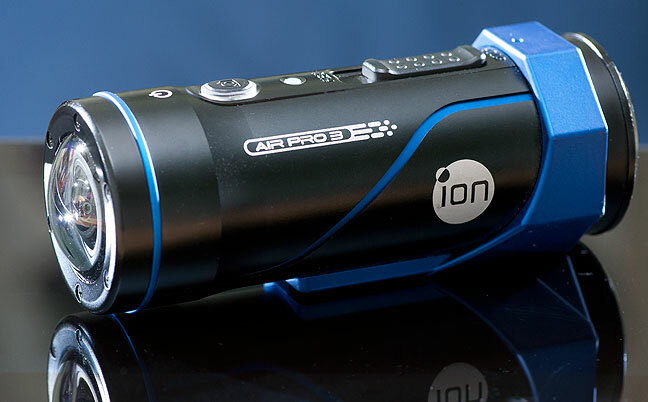 I made some video with my Ion camera on its stick through the Rogue’s sunroof of The Hogback, a high, narrow strip of highway. After getting a coffee in Boulder, I did the same video in reverse. I decided to drive through Zion National Park, since I had the time and a Park Pass. I did the same thing in the summer of 2008 and found it too crowded and hot, but hoped the early spring would relieve both. By the time I got to the visitor center, I began to think otherwise, though I was willing, as the signs and radio recommend, to park in Springdale and ride the shuttle into the park. Springdale held the answer: return in mid-winter or not at all. I drove all the way through town and never saw one empty parking spot. 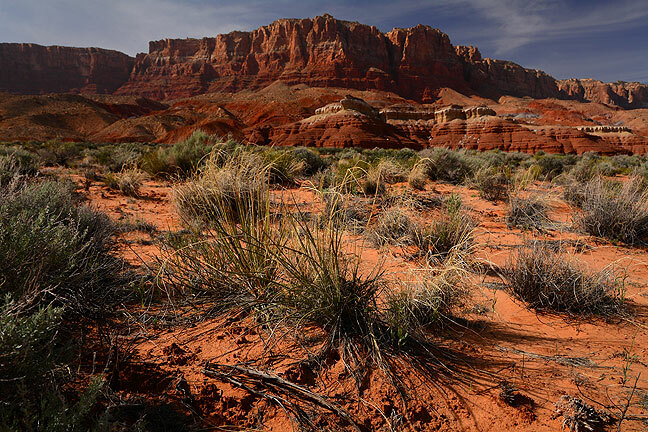 I stop and photograph Vermilion Cliffs every time I drive past. The first time I saw it was when my wife (then girlfriend) Abby and I visited in July 2003. 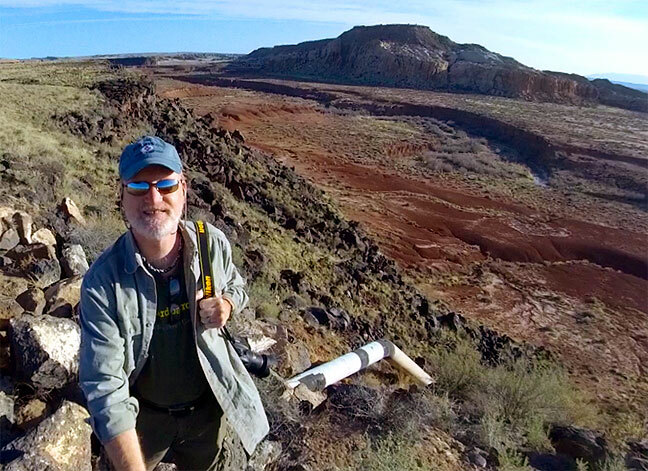 With Zion behind me, I headed east along Arizona 389 to Pipe Springs National Monument, location of a water source used by settlers. The park itself wasn’t of much interest, but there was a short hike up the mesa above there park, so I took it and made a few images. Even when I have hiked all my planned trails, I still try to find hikes. 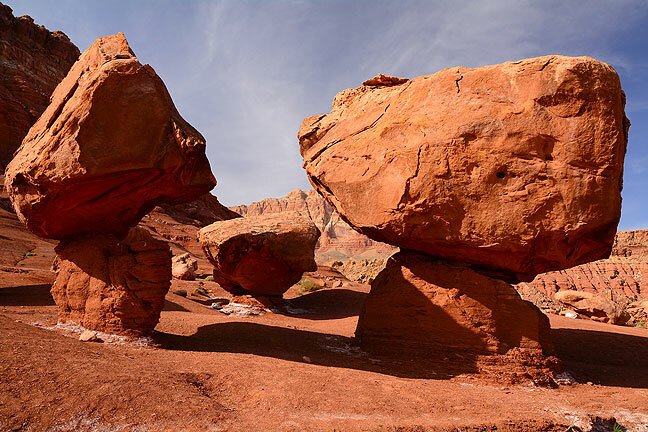 These hoodoos sit next to the road in Cliff Dwellers, Arizona, with the Vermilion Cliffs soaring behind them. Continuing east, I discovered that the North Rim of the Grand Canyon was still closed for winter. 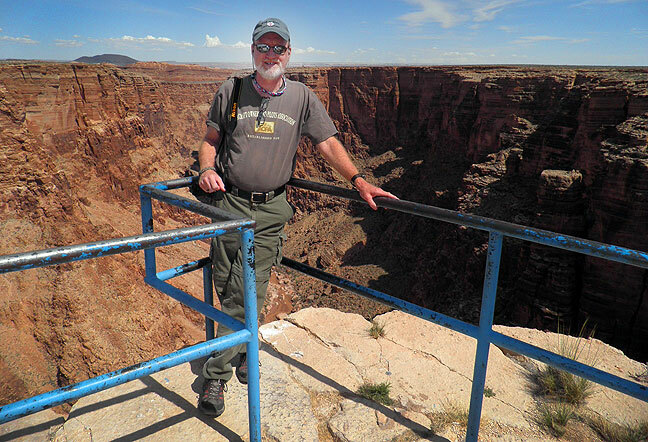 Father along I joined U. S. 89a and followed it down the Kaibab Plateau to the Vermilion Cliffs. I stopped at a couple of locations and made pictures despite the hazy light, including the abandoned rock house in the town of Cliff Dwellers. 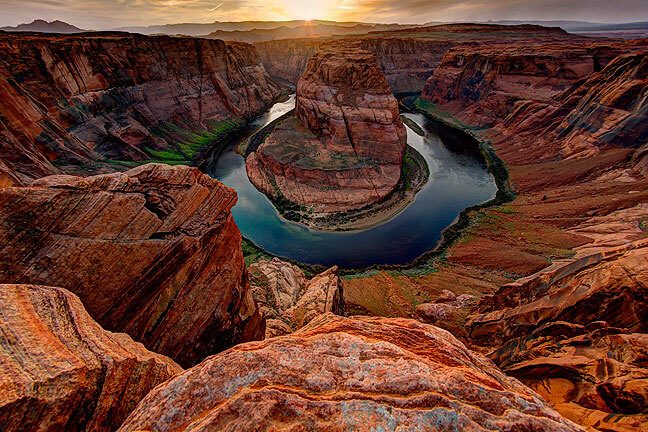 Since I decided to stay in Page, Arizona again, I thought I would visit Horseshoe Bend of the Colorado again, which I saw photographed in 2012. For reasons that were unclear, there were even more people at the site that three years ago; three or four hundred at least. Despite the crowds, I had fun making pictures of them and the Bend at sunset. Many of the other photographers (those with tripods and DSLRs like me) were making multi-frame high dynamic range exposures like I was. As in 2012, I got a fairly bland performance from the sky. 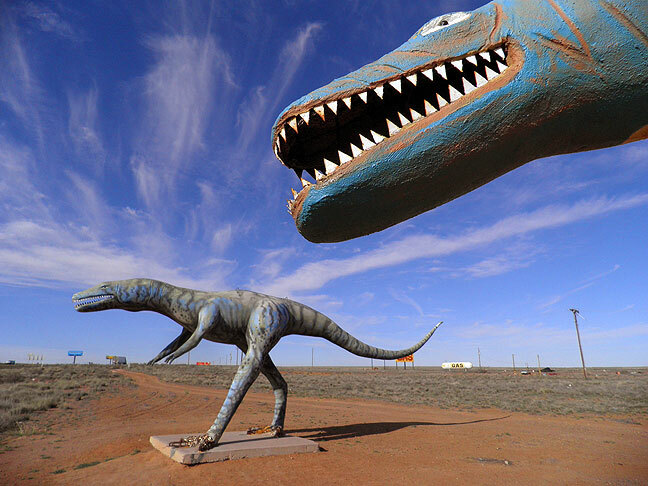 One of the sights along the road was this collection of dinosaurs near Holbrook, Arizona. Up before dawn in Page, I got breakfast and headed east toward Navajo National Monument. I stopped to shoot the early light striking the Navajo Generating Station, then a handsome cluster of hoodoos farther along the road. GPS gave me some bad advice about how to get to the Monument, but after stopping to look at the map, I arrived by mid morning. It was sunny and very windy, and cooler than previous days. The long, ranger-guided trails were closed, but I took the three short ones and made a few telling images. 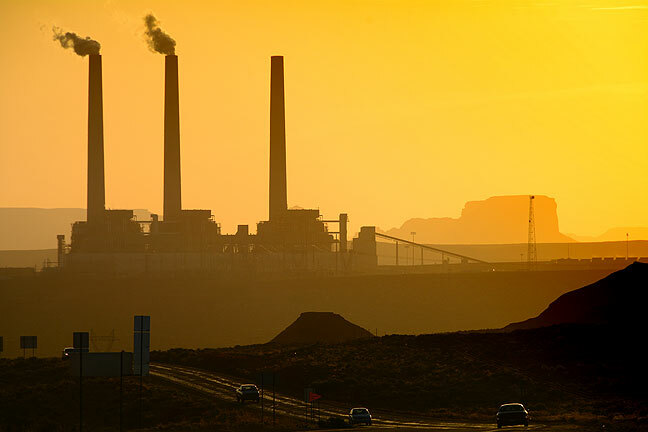 The Navajo Generating Station picks up early morning light as I drive east from Page, Arizona. 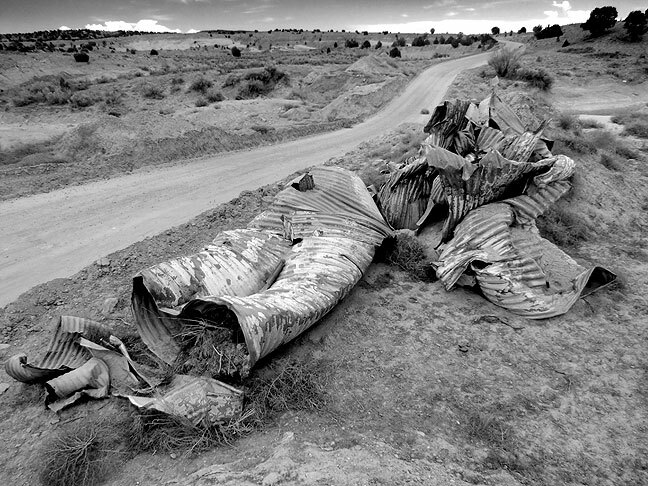 Power lines lead away from the Navajo Generating Station in northern Arizona. 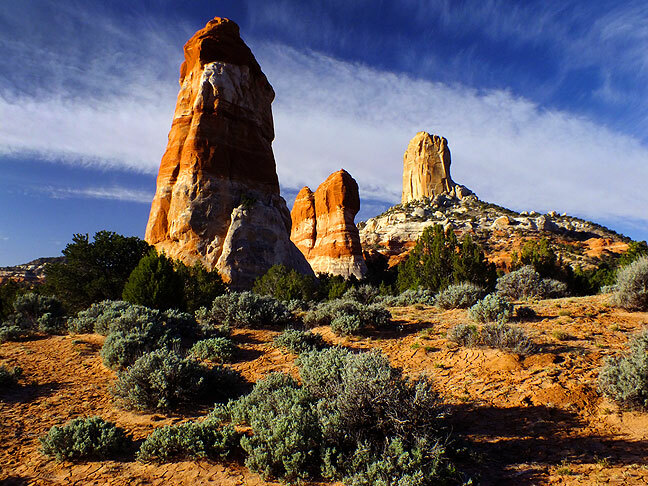 I stopped to photograph this remarkable outcropping of hoodoos along Arizona 98 near Navajo National Monument. On Interstate 40 west of Albuquerque, I saw the sign for highway 6 and thought I would scout the same spot I saw 15 years ago, if only to make a photo of myself in the same spot. I don’t recall if I had to climb a fence (and trespass) to get to the edge of the canyon in 2000, but I did this time, without hesitation. 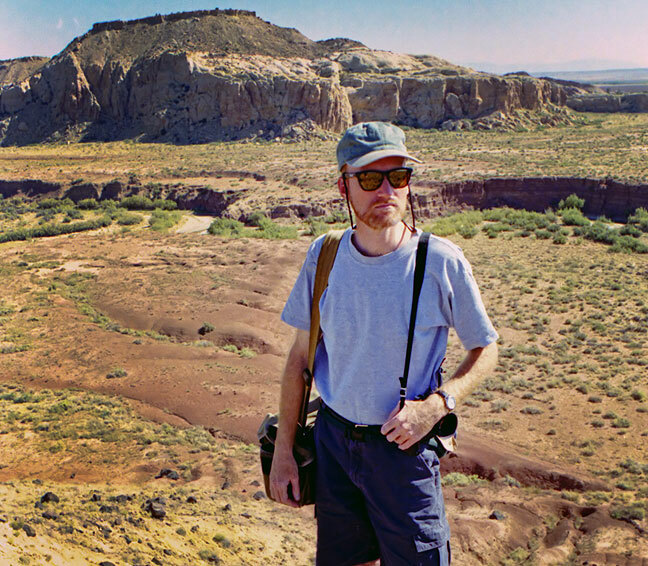 The canyon and mountain beyond were just as beautiful as it was all those years ago. …and this is me near the same spot this year. Neither I nor the canyon have changed all that much. Near the end of my trip I stopped to photograph State Highway 6 at its closest point to Rio San Jose in central New Mexico, which I photographed once other time, in July 1999. This is a two-panel panograph – click it to big it. There is a scene from the movie Patton in which soldiers are arguing about where they are as they advance across France. One of them says, “This place isn’t even on the map!” “You know why? We’ve run clear off the map!” I thought of this as I drove farther than I had planned, to the point where I didn’t even have the right maps with me. Am I the Lord of the Rings? 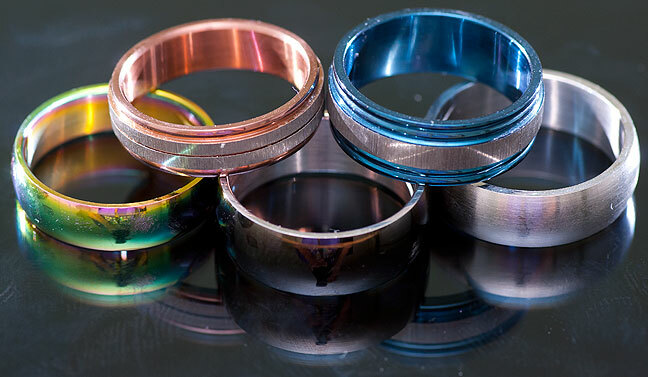 I bought five cheap, cool stainless steel rings for myself at various locations in my travels. They replace the Moab ring that I broke last year. When I am on the road, I love the feeling of running on coffee. I get big cups of black coffee all day long. As I was discussing my plans, a coworker asked me, “What do you eat? !” I thought it was funny because when I am hiking and camping, everything tastes fine and nourishes me, no matter how primitive. I ate either MREs or commercial camp food from brands like Mountain House or Backpacker’s Pantry. The macaroni and cheese wasn’t very good, but the rice pilaf was nice. For meal or coffee/tea preparation, I boiled water using my JetBoil stove. Once again, a number of people asked me if I worked for the park service or BLM, and I kind of decided that it’s not only that I wear organic colors like green and tan, but that I always have lots of stuff on my belt. Never miss an opportunity to buy ammo or gasoline, or to urinate. The music for the video is Led Zeppelin’s Bonzo’s Montreaux, and the video is hosted on Vimeo because YouTube rejected the music because of copyright infringement. If you prefer, click here to watch this movie in higher definition. 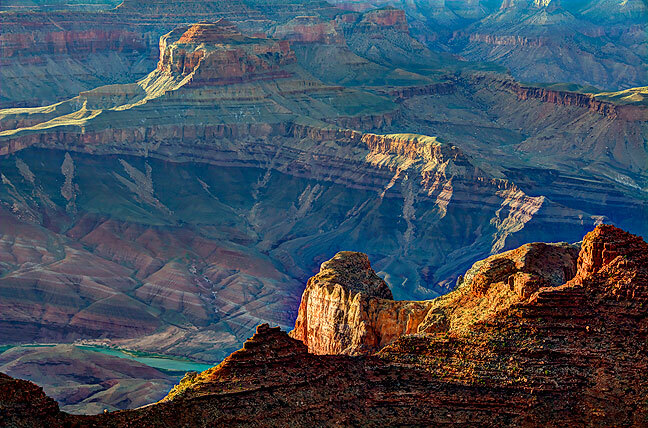 The depth, the color, the complexity of the Grand Canyon comes out in this Navajo Point exposure.